Posts Tagged "the mortal instruments"
If you follow me on Twitter or have read my blog for a while, you know that I’m really into the YA (young adult) book genre. It all began with The Hunger Games, then I moved onto Divergent, The Mortal Instruments, The Infernal Devices, The Maze Runner, and more to come! I was beyond psyched when they announced filming for The Mortal Instruments. As I’d just fallen in love with both the books and movie for The Hunger Games, it was almost too good to be true! It kinda was. While I am obsessed with the books, Harry Potter and THG has really spoiled me in terms of high quality book-to-movie adaptations. The Mortal Instruments wasn’t an abomination, by any stretch of the imagination, but I certainly was expecting better. Let me share some of my thoughts after my first time seeing City of Bones. They’re in no particular order; just what happens to pop into my head as I write this post. 1. Waaaaaaay too much lovey-dovey stuff. The Twilight effect is real, and I didn’t like that it was the main focus in this movie. I know that stuff sells, but there was so much more to City of Bones, in terms of character and plot development, that didn’t happen because it was all about the love triangle. Ugh! Part of the reason I enjoyed the book so much was that they walked me through what the Shadowhunter world entailed, step by step, as Clary was learning herself. A lot of that was skimmed over, or ignored, in favor of stupid love/tension scenes. 3. I thought the actual City of Bones scene was cool. Like the Silent Brothers themselves, as well as the Bone City imagery. Stunning. 4. I liked seeing Jocelyn fighting to get away from the demons, while warning Clary to stay away. We could only assume how it went down, in the book, but we got to see it in the movie. Nicely done. 5. I understand some things have to change when you make a book into a movie, but I really missed Simon being turned into a rat, and kidnapped because the vampires thought he was one of theirs. Maybe it wasn’t in the budget, but I missed that. A lot of the Simon-ness I came to love in the book, wasn’t in the movie. He and Magnus are my favorite characters. So, I want more of them! 6. Also, what’s with Simon’s eyesight getting better after getting saved from the vampires? That was weird. And the 2 bites on him that Clary saw? Is that really how it happened? (I need to re-read the book. No, rat-Simon bit a vampire & that’s how he started to change.) Why didn’t they even revisit that observation again? Clary saw it. Wouldn’t she go to someone, like Hodge, and be like “Hey, I saw these 2 suspicious looking bites on Simon. Can someone check them out?” I don’t even know. But since he needed to achieve “darkling” status somehow, I guess that was as good as any. Still meh. 7. When they announced Jemima West was cast as Isabelle, I was not impressed, but having seen the movie, I thought she did a great job and I like her in that role. She owned it! 9. Not enough Magnus Bane. But really, there’s never enough Magnus Bane. He is amazing. The end. 11. Did anyone else catch that Hodge told Valentine to lie and tell Clary and Jace that he was both of their fathers? That takes all the fun out of everything! The audience isn’t supposed to know it was all a lie until City of Glass, dammit! The best part of being a fan of the TMI series is seeing people read the first book and freak out at the end, while we secretly laugh at them. Harald Zwart stole that from us! 12. THE FINAL FIGHT SCENE DIDN’T GO DOWN AT THE INSTITUTE! Like, that was a huge change! More budgetary reasons? I mean, it wasn’t a terrible change, but it did catch me a little off guard. 14. Luke is hot. Really hot. I could have used a lot more scenes with him in them. 15. There wasn’t enough Simon/Jace back and forth banter. Their interactions were some of the best part of this entire series. City of Bones could have used a lot more of this and less of the love crap. 16. Little things, like how they didn’t explain how glamours, and other things worked, irked me. I had a friend with me, who hadn’t read the books. She said she would have been really lost a few times if I weren’t there to explain things. People should be able to follow, without a ton of questions, if they haven’t read the books. 17. I know it was announced long ago that Raphael wasn’t supposed to be in this movie, but I still missed him. I loved the book scene of how he tricked them into going into Hotel DuMort to get Simon. So, there you go! My kneejerk and spoilery account of the City of Bones movie! I know this list is long and makes it look like I hated it, but I swear I didn’t! I mean, I didn’t LOVE it, but I did enjoy it. I do plan on seeing it again, so we’ll see if anything changes after a second viewing! The past couple of months have been quite eventful in the land of all my young adult literature fandoms. My cup runneth over, y’all! I’ve pretty much in nonstop super fangirl mode for the past week. So many exciting announcement and reveals are happening! Let me give you the rundown right quick! 1. The Hunger Games started its own official Instagram account. Check it out: instagram.com/thehungergames! On there, they’ve begun hinting that something is going to go down on May 14th. Eeeekkk! 2. Continuing the Instagram theme, The Mortal Instruments’ Instagram page was teasing official character posters all week. We got to see Simon, Valentine, and Magnus Bane’s posters. So exciting! 3. Over in Divergent land, a lot was happening as well! Veronica Roth revealed the cover art for the final book in the trilogy, Allegiant, on the Today Show. It comes out on October 22nd and I can’t wait! 4. Keeping it in Divergent-land, it looks like the sequel is already in the works! Deadline Hollywood reported that Brian Duffield had signed on to write the script for Insurgent, the second book in the trilogy. This is an extremely good sign as Divergent has only been filming for a few weeks! What a vote of confidence! 5. Divergent isn’t the only one of my beloved series to get the greenlight towards a sequel movie adaptation, though. In Cannes, it was just announced that The Mortal Instruments: City of Ashes (book #2) is being put into production and will begin shooting later this year. 6. The Mortal Instruments‘ prequel series, The Infernal Devices, also has a script in the works. This news didn’t break in the past week, but it’s still fresh enough in my mind to make me include it in this post! Oh yeah! 7. And lastly, let me tell you about the most recent book I’ve read, The Maze Runner. Filming is set to get underway on Monday, in New Orleans. Some really amazing concept art has bee premiered by Entertainment Weekly. It was even more detailed and chilling than I even imagined it! Now, I’m not paying too much attention to the cast and production of the movie just yet because I’m not done reading the series. I still have to start/finish The Scorch Trials, The Death Cure, and prequel book, The Kill Order. I’d rather do so while creating the characters in my own head. Then, I’ll re-read the series later after getting up-to-speed with movie filming. Sooooooo, that’s why I’ve been smiling ear-to-ear this week! The worlds I escape to, when real life is just too much, had a lot happen recently and it really brightened my spring! Remember last year when I announced my New Year’s Resolution was going to be reading more? I justified buying my Nook Color, Lula Mae, by saying it’d help me read more. Well, 2011 was slow, as I read 4 books, but that’s 4 more than I read in the past 5+ years combined! Baby steps, right? Then 2012 came along — specifically The Hunger Games — and now I can’t stop reading! Since March, I’ve read 10 books! Yes, 10! And all of them have been read on my Nook Color! Success! Something about the Hunger Games trilogy just sucked me in, completely. I was literally obsessed with all things Hunger Games. Still am, to a point! But then the Hunger Games fans recommended another series to me Divergent (It’s only 2/3 completed/released as of this posting). So, I devoured Divergent, and its sequel Insurgent. Fell in love again. 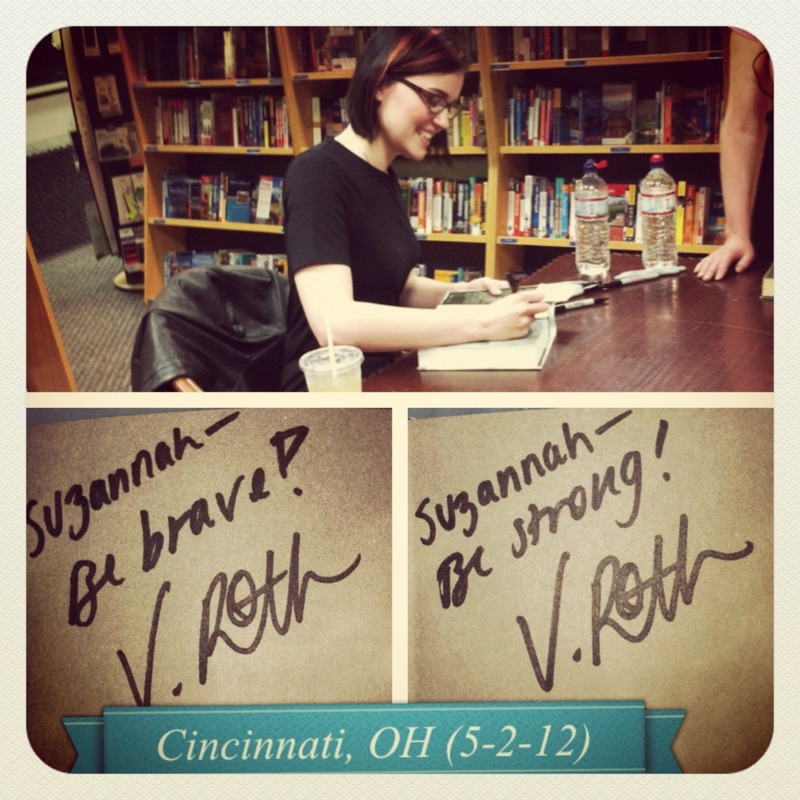 I even drove to Cincinnati and met the author at a book signing. I can’t believe I went a book signing! Me! 2011 Suz could never have envisioned that this would have happened, but it has!